FIFA 11’s maintained its top spot in the UK charts as Call of Duty: Black Ops edges closer to tumbling out of the top three. 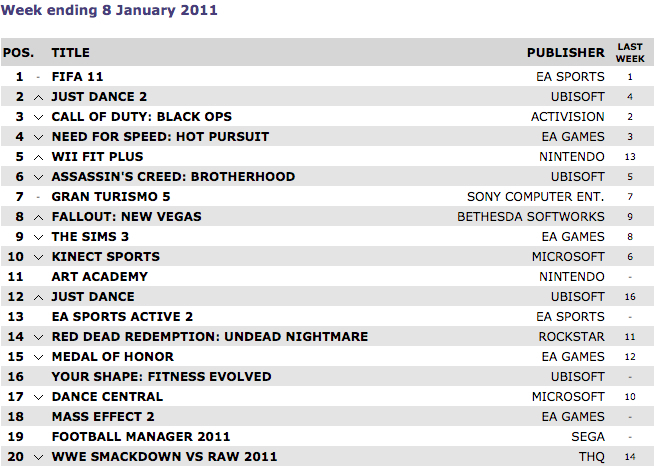 The Treyarch shooter is third as Ubisoft’s Just Dance 2 gets second. Criterion’s Need for Speed: Hot Pursuit and Wii Fit Plus round off the top five. Top 20 for the week ending January 8 is below. Last week’s data is here.